One of the most effective and challenging bodyweight exercises for your upper body is the pull up. By doing this exercise regularly, you can get a ripped back and arms. Luckily, pull up bar products are often affordable and take up little space in your home. Purchasing one is a no brainer! With your own pull up bar, you can do this excellent exercise on a regular basis, improving your strength and toning your upper body. You can even lose weight by including pull ups in a larger exercise routine. So, whether you’re hoping to get fit or you want to bulk up and get stronger, a pull up bar should be on your list of equipment to purchase. In this article, you’ll learn more about the benefits of doing pull ups. Then, we’ll get into the details of the types of pull up bars available, the features they offer and which products are the best for adding to your home gym. Everyone should do pull ups as a part of their regular exercise routine. They’re a fantastic exercise that offers numerous benefits. But, they’re also very difficult. In fact, they’re so difficult that the Marines require that hopeful male candidates perform a measly 3 pull ups! Why should you struggle through them? What muscles exactly are activated when you do pull ups? When you perform pull ups, you build your upper body strength in a serious way. So, doing pull ups, or variations on them, is a great way to build your strength. The best part? Pull ups are a natural movement you might use in everyday life. For example, if you need to climb up on top of something or pull an object, you use similar muscles and movements. What’s the Difference Between Pull Ups and Chin Ups? Are pull ups and chin ups the same thing? No. Although they are similar, the hand position used in chin ups usually makes them easier to perform than pull ups. 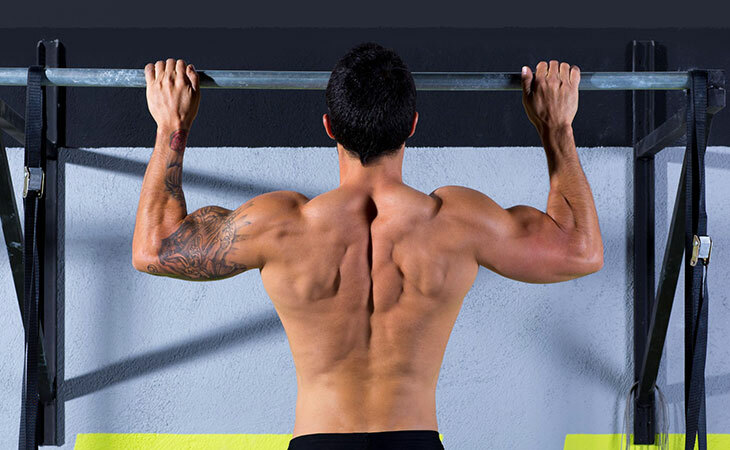 With pull ups, your hands are facing away from your face. Your grip is also slightly wider than when performing chin ups. When doing chin ups, your hands should face you in a supinated grip. Pro Tip: Don’t let anyone knock your chin up efforts. According to a study, chin ups are more functional and effective than using a lat pulldown machine. However, if you can’t perform a chin up or pull up yet, doing reps on the lat pulldown machine is a great exercise to help you build strength in the right muscles. Ready to choose a pull up bar? If you want to purchase a home pull up bar, there are many options available. But, how do you know which is best? Which pull up and chin up bar will offer you the best value for money, flexibility and ease of use? In the following guide, you’ll learn exactly what to look for in a home pull up bar. In addition to the basic features offered by each pull up bar, we’ve also included the science behind which bars are best. Take a look at the different types of pull up bars and then get to know our favorite products. 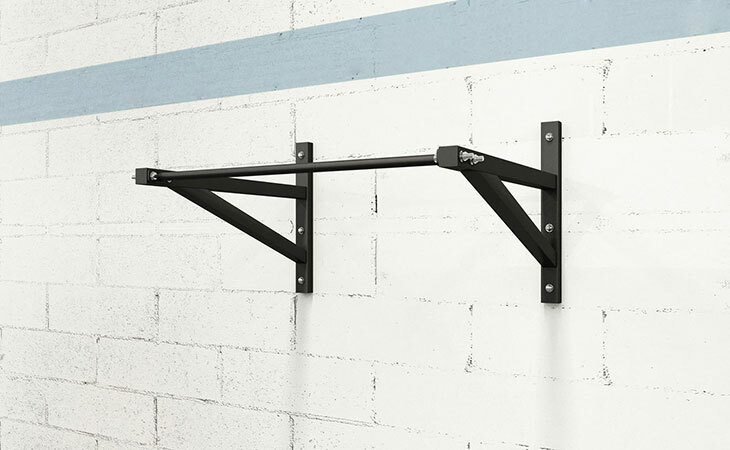 With a wall mounted pull up bar, you get great stability and weight capacity. In addition, you won’t have to fiddle around with the bar’s position on a regular basis. However, with a wall mounted pull up bar, you will need a dedicated space for the bar. Wall mounted pull up bars are great in many ways because they can generally handle more weight than door frame units. Furthermore, you can add attachments with confidence thanks to the stability they provide. The ultimate solution for small houses and apartments without a dedicated exercise space, doorway pull up bar products are popular with good reason. With a door pull up bar, you can do lots of basic exercises including both pull ups and chin ups. Some offer additional attachments that you can use to do other exercises such as dips or leg and knee raises. All in all, door frame pull up bar products are practical, portable and easy to stow away when not in use. Do keep in mind that you might find some grips with a door frame pull up bar a bit of a tight fit. However, research shows that variations in grip widths doesn’t make a big difference in muscle activation. According to the review, for the greatest activation of muscles, you should use rotating handles or rings. Door frame pull up bars are somewhat portable, but you still need a doorway with which to use them. If you want true portability, try a standalone pull up bar stand that you can cart around anywhere you’d like. You can use a standalone pull up bar outdoors or indoors, and move it around the room, positioning it wherever you’d like. Make sure you keep in mind that portable pull up bars may pose the same issues as door frame pull up bars: grips may be uncomfortable depending on where the cross bars are located or how long the bar is. Read reviews to make sure you’ll be able to do pull ups comfortably. Also, with some models you can use attachments such as rings for maximum activation of muscles. In this category, you might include power towers. While they’re not as portable, they are stand-alone. Power tower products allow you to complete a variety of exercises from knee raises to pull ups, push ups, dips, and more! If you’re looking for maximum versatility in terms of exercises, a power tower may be what you’re looking for. Can you make your own pull up bar? If you’re handy, a DIY pull up bar might be a viable option for you. If you have exposed beams in your home and can do a few simple knots, you can make this easy DIY pull up bar. Which Is the Best Pull Up Bar According to Science? According to science, making use of ring attachments for the greatest muscle activation is the best way to do pull ups. So, choose a bar that will allow you to add this sort of attachment. But, there’s more to consider. If you can’t do pull ups yet, then experts recommend that you use resistance bands so that you can still practice the exercise, but with assistance. You can also do the TRX biceps curl using an attachment on some pull up bar equipment. Not all pull up bars will tolerate this sort of use. However, wall mounted units will almost certainly allow you to use all of these types of attachments. The bottom line? If you can already to pull ups, just about any bar will allow you to continue building your strength. But, if you need to build strength to be able to do your first unassisted pull up, opt for a stable wall mounted unit. This will give you the most options to perform a variety of exercises using accessories that will prepare you to be able to do your first real pull up. 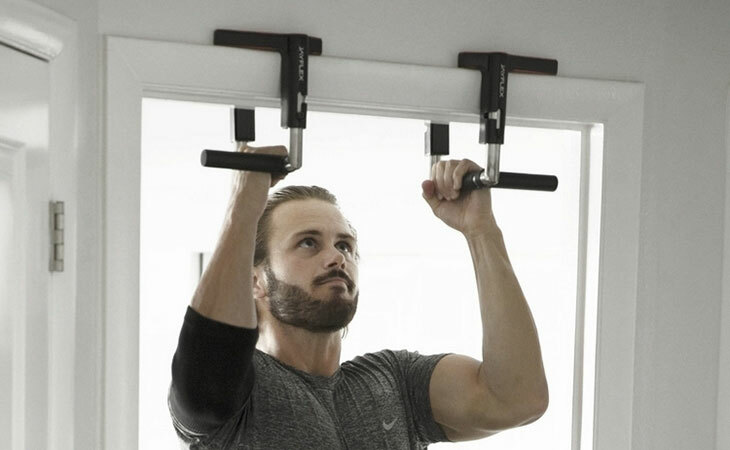 This solid wall mounted pull up bar offers 53 inches of space for you to use at your discretion. 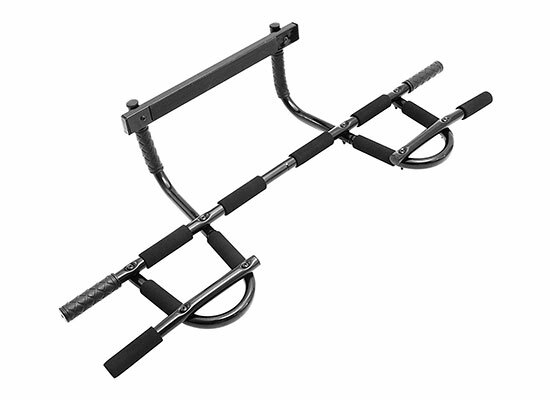 Whether you do wide grip pull ups or narrow chin ups, this bar will hold you and any additional weights with ease. We love the robust construction, high weight capacity and the versatility it offers. For an affordable, but heavy duty wall mounted pull up bar that stands the test of time, Titan Fitness’s model is the way to go. With it, you can use a whole range of attachments including rings, resistance bands, and more, without any trouble. All you need to do is install it with care and you’ll enjoy the many benefits. 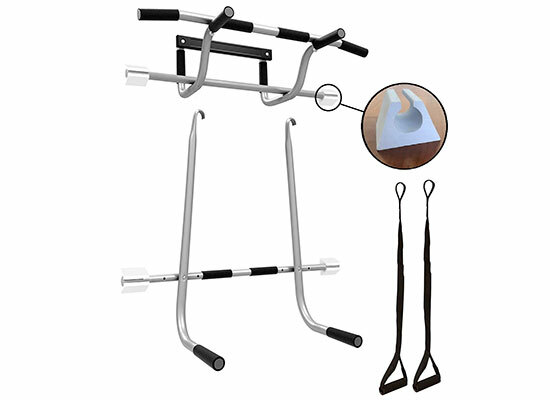 Offering an impressive variety of grip positions, including a neutral grip, this incredibly affordable doorway pull up bar will help you get a great upper body workout. If you have a limited budget and space, this doorway pull up bar is a no brainer. Put it up when you’re ready to work out and take it down when you’re done with little trouble at all. Prefer a free standing pull up bar? 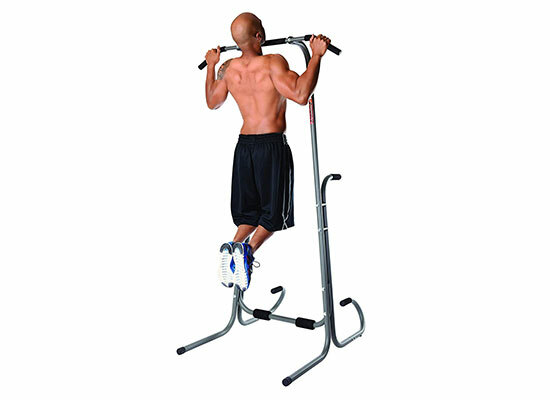 Stamina’s Power Tower fits the bill, allowing you to perform a variety of exercises including pull ups. For great versatility that will allow you to perform a many exercises, this is a great choice. However, it may not work as well with attachments such as rings or resistance bands. If you want the most out of your doorway pull up bar, opt for this product that will also allow you to perform dips. The best part is that it comes with a lower bar so that you can try Australian pull ups and it also comes with suspension straps that you can use for your pull ups. If you want a power tower that’s easy to set up and take down, this doorway pull up bar will do the job. At an affordable price, you can make use of even very limited space to place a functional, durable gym setup and get ripped! This wall mounted pull up bar hangs on hooks to allow for two basic functions: a pull up bar and a dip station and captain’s chair. You get maximum use for various exercises on a sturdy, wall mounted machine, to which you can add attachments with confidence. 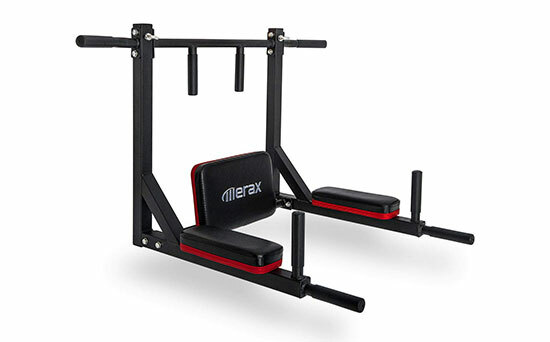 If you want a wall mounted pull up bar with maximum versatility and ease of use with attachments, this Merax wall mounted pull up bar is a great choice. Customers rave over how sturdy and functional the equipment is. Grasp the pull up bar with your palms facing away from you. Jump if necessary. Then, hang and cross your ankles. Try to keep your shoulders relaxed, but engage your abdominals for stability. Pull yourself up, driving your elbows down to the floor and bringing them close to your sides. Continue to pull until your chin clears the bar. It’s important to avoid using momentum by swinging or jerking when performing push ups. Instead, focus on using your strength and doing the exercise slowly and methodically. You can use a resistance band to help you perform a pull up if you’re not ready to do one on your own yet. Take the resistance band and hang it over the pull up bar. Then, pull one end of the band through the other end, so that it attaches. Next, grasp the bar as if to do a pull up, but place your feet in the resistance band. Now, perform your pull up. Adjust the resistance band as necessary to make performing the pull up easier or harder, depending on your level. Use a sturdy towel to improve your grip strength and muscles. In particular, this will work your hands and forearms in addition to muscles used to do pull ups. Simply hang a towel over your bar, so that it’s evenly distributed with half on each side. Then, grasp the towel, one half in each hand, and perform your pull up. Also known as body rows, these pull ups change your position quite a bit. You’ll need a lower bar or a long ring attachment to do this variation. Lie underneath the bar and grasp the bar as you would to do a pull up. Your legs should be straight out in front of you, resting on your heels. Then, pull your body up so that your chest almost touches the bar and slowly lower yourself again. Australian pull ups really make you engage your core, but also work your back, arm and shoulder muscles like traditional pull ups. These chin ups or pull ups are especially useful for individuals who can’t yet do a full traditional pull up on their own. However, you can also practice these to increase your strength and increase the number of reps you can perform. How do you do it? Grasp the bar as for a traditional pull up, but instead of pulling yourself up, jump to the highest position where your chin is just above the bar. Then, lower yourself very slowly to a hanging position. Use a weight belt to add more resistance to your pull ups once you’re doing well with them. If you don’t have a weight belt, you can also rest a dumbbell between your ankles. In any case, adding some weight while you’re performing pull ups will add challenge to your workout and help you get stronger. While not always recommended because this type of pull up increases risk of injury, kipping pull ups are popular. These types of pull ups employ swinging and momentum to help you do more pull ups, faster. They’re often used in crossfit workouts. Fitness enthusiasts say they can perform more kipping pull ups, increasing their rep numbers. But, you really need to have good technique to do them and for most people it’s probably best to stick to traditional pull ups. In this advanced variation, you pull yourself up well above the bar until your chest can touch the bar. The chest to bar pull up requires additional strength, since you’re lifting your body higher than during a traditional pull up. What If I Can’t Do a Pull Up? Are pull ups still beyond you? If you’re unable to perform a traditional pull up, you can work your way up to it. As mentioned above, you can try a range of other exercises such as assisted pull ups using a resistance band, lat pull downs and Australian pull ups. In addition, you can do TRX bicep curls using an extension on your pull up bar. Choosing a pull up bar can be a game changer in your home workouts. With this piece of equipment, you’ll be able to workout your core, shoulders, back and chest like never before! With the details and product reviews in the article, you should feel much more ready to purchase a great pull up bar that will help you achieve your fitness goals. Before you know it, you’ll be pumping out those pull ups or working efficiently towards being able to do a full pull up on your own! Do you have your pull up bar? What do you love about it (or hate!)? 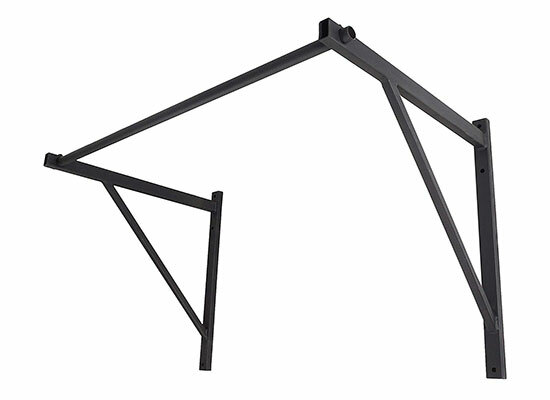 Tell us about your pull up bar buying experience in the comments. The post 4 Home Pull Up Bars: From Budget to Commercial Quality appeared first on Livin3. Epsom Salt Weight Loss: Relax & Lose Weight! Previous story Jenelle Evans: Will She Lose Custody of Kaiser to Nathan Griffith? !